Silver medal 470 sailors Saskia Clark and Hannah Mills are ready for their most challenging venue yet in Rio de Janeiro. 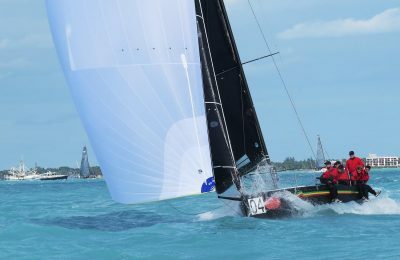 For those not familiar with dinghy sailing, what are the characteristics of 470 racing? 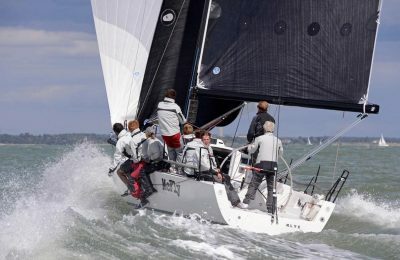 The 470 is a great mix of what sailing is all about. At the lighter end, the racing is a close, tactical battle. The boats are moving quite slowly, so there is time to think through your strategy and tactics like a game of chess. As the wind increases the boats get planing, becoming more physical. You need a more dynamic technique through the waves and the decisions on strategy need to be made faster as you react to the wind and your competitors. Going in with good form must give you some confidence? We are pleased with the process we have gone through this four years and feel we are a better, more competitive team than in 2012. Winning the final two World Cups in the run-up to the Games has given us a clear indication of the areas we have improved on and what still needs to be done, but at this point in time, we are pleased with where we are. What are the biggest challenges with Guanabara Bay concerning tide, the wind, etc.? It’s a hugely tricky venue, surrounded by high land which the wind has to find a way through and lots of bays and headlands for the tide to flow and eddy around, which is massively affected by the amount of rainfall. So lots to think about! What changes have you had to make to your boat set-up to account for the conditions? It’s a hugely varied venue from the flatter water inside the harbor to ocean swell outside so learning how to adapt and optimize our equipment over this range has been critical as we only measure in one set of equipment. Have you had to change anything else significant, for example in your training program? We have changed hulls this cycle from the Mackay to the Zeiglemayer. Programme wise, it varies as to where you are in the cycle and the priorities but this cycle we have spent a significant amount of time on breaking down and rebuilding our race observations and communications, so they are robust under the stress of the Olympic competition and venue. Who do you see as your biggest competition? 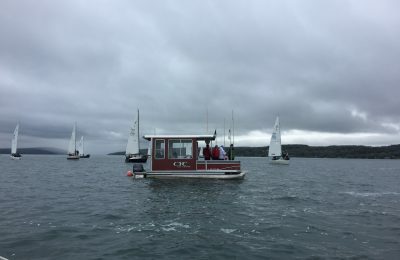 Are there any dark horses in the fleet? There are obviously a few key contenders that have a good track record either in Rio or at the big events. However, Rio is an opportunistic venue and the Olympics inspire and stress people out in different ways so we expect that any number of people could get themselves into contention. What is the dynamic like between helm and crew and therefore you and Hannah? Hannah and I are lucky that from the beginning we just got on well and enjoyed the challenge and journey of an Olympic campaign together. We’ve managed to drag each other through some lows and enjoyed the highs together and will go into this Olympics with a great understanding of how we both enjoy working as individuals and how this feeds our team dynamic. What were the key factors behind your decision to be powered with North Sails? What products are you working with? We use North Sails from Japan for our full suit and have found the reliability and attention to detail of the product better than anything else out there. In that sailing will be much closer this time, do you expect to see any other events or hang out with any other members of British team? Ironically now that sailing is in the heart of the city, most of the action is happening at the Olympic village which could be up to a two-hour drive away with traffic (even though it’s not that far)! Until we have finished our racing, I expect it will be much the same as the other Olympics I have been to. Hopefully, afterward, we can get a taste of all the excitement of being in the center. What is your final run-in plan to Rio? We leave for Rio on Sunday (7/24) and have the potential for 15 days training before we begin racing. So there is still a lot of time to refine things. We are pretty clear on what we need to get done in that time. It will focus around short course boathandling and set pieces which are easier to do in a confined space when all the race courses are occupied around us. How do you think this Games will be different from the others you have done? Rio is the hardest venue of all so dealing with that under pressure will be key. Most of the course areas are very tricky and even if you are out in front you can’t relax and think that you’ve got that race in the bag. It really won’t be over until the finish line of the medal race. Finally, what are you looking forward to the most about the Rio Olympics? We just LOVE the Olympics! I love watching it, love competing in it, it’s just so exciting! It’s an absolute privilege to represent Team GB, so we’re looking forward to getting out there, racing and delivering.